A few thoughts about the recent clinic in Essex. We gathered in the stable block and talked about the areas we wanted to work on either at the clinic (for those with horses there ) or at home for the auditors. Getting motivation was quite a key topic, making it worthwhile for the horse to want to target objects or to stand at stationary targets. Not to be stingy with the reward! 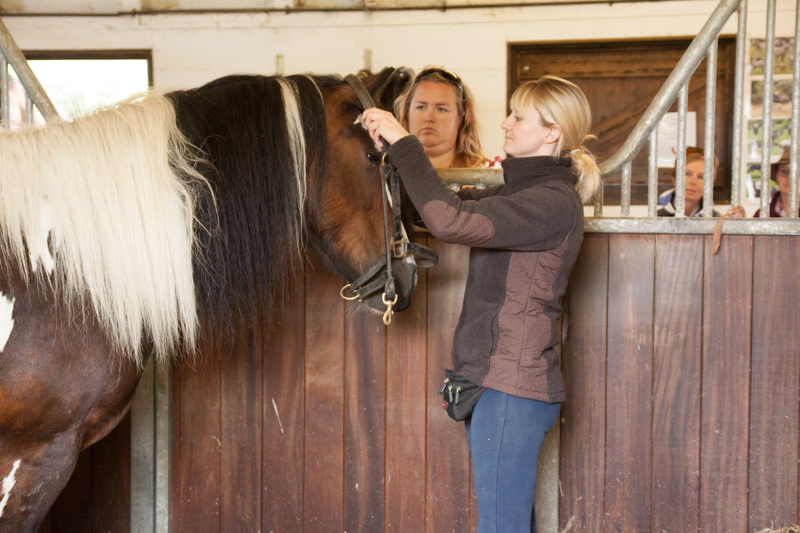 The first session was working on getting the horse to calmly target the target stick – all the participants had a history of using reward based training. It was therefore building on and refining what they were already doing. The session on getting more whoa was interesting as the horse seemed very calm and most unlikely to be a “bolter”. I put bolt in brackets as true bolters I think are in an extreme state of fear and not just enthusiastic and strong out hacking. Sometimes we inadvertently cause them to get over aroused – excited, especially in the company of other horses. Shawna worked on using the target to get the horse to move and then stopping and targeting – click and treat for the stop – then add rein cues to the process. The horse got a bit confused when the rider clicked as he was still looking to Shawna as the person with the treats. At the end of the session the rein cue had begun to mean stop. 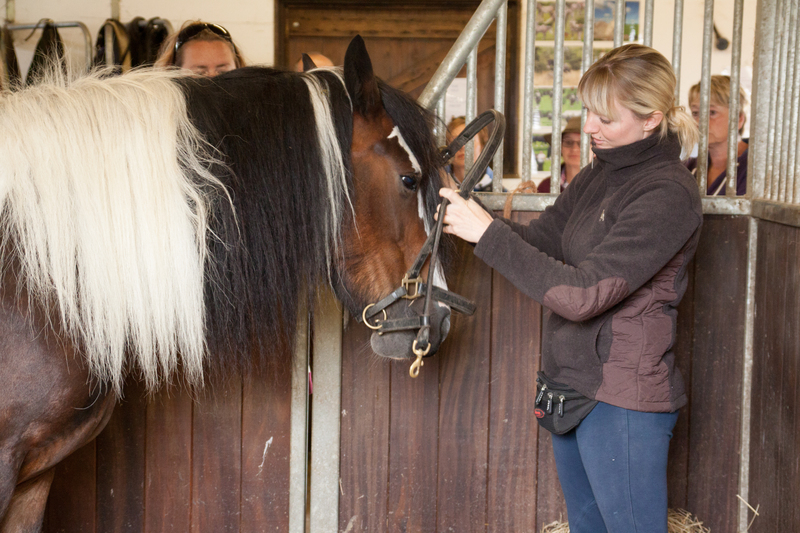 This same horse needed to be given a nasal spray, so the process of desensitisation was discussed and he got used to having his nostrils touched but there was more work to be done on another day. The horse with bridling issues was the one with going forwards in the school issues. Shawna worked with the horse in the stable with the owner using a leather head collar at first, gradually introducing the noseband over the nose. Desensitising to the whole process, still more sessions needed to get it solid but the horse seemed less anxious about the bridle in the end. Next into the arena with the same cob – the problem was the rider wanted more forward motion with out escalating pressure. Shawna had the horse moving towards a target pole and the rider clicked and treated for the slightest forward movement. The horse with the anxiety issues when horses or people approached from a particular side was interesting. The owner said eyes had been checked but a few people thought there may have been a more physical issue than a purely behavioural one. Shawna had the owner with the horse online on the good side to start taking him to the side of the arena were the audience was. Several people stood up and moved as the horse went by, not much reaction on the supposed good side Changed the rein and did the same thing – a bigger reaction on that side but not overly spooked. Clicked and treated for any calmness as he passed people. The one person went outside the arena and stood on a chair, as the horse went by she waved her arms – and the horse did a major spook and looked quite panicky. He was rewarded for being calm – he did calm down quite quickly. A few more circuits with less extreme movement from the person the other side of the hedge, gradually resulting in the horse being calmer and calmer. This too was a form of desensitisation. Then the resident horse who seems to dislike the arena. The target was used to get him calmly walking round the arena. Gradually getting him closer and closer to the scary corner! Shawna seemed like a magnet for the horses and sometimes the owners had difficulty getting their horses attention back to them. Shawna did move from the horse area to the spectator area a few times, with lots of breaks for the horse in between chunks of training. What I learned from day 1 – take things at the horses pace, don’t be a greedy trainer and ask too much or too soon. Give the horses time to process and calm down after a short session. Don’t be stingy with the rewards either, jackpot after a session and leave the horse with a good feeling. Timing is everything, click/bridge for the behaviour your want at exactly the time the behaviour occurs. A few photos from the day are on Facebook – the rest are in a Photobox gallery. I received books about clicker training for Christmas – Alexandra Kurland’s Clicker Training for your Horse is excellent. Lots of sensible advice on using all quadrants of operant conditioning. There is usually more than one solution to a problem, so the more tools we have in our tool box the better we are able to solve problems. Whether this is positive or negative reinforcement, or redirecting or counter conditioning we can decide what the best way is for our particular animal. As my daughter has just acquired a foal all this information will be very useful. Many chapters are on foal and young horse handling. So now after a festive family Christmas I will be off to the field to do more target training. Also I won’t chastise myself for using a little light negative reinforcement – using tactile cues e.g leg aids. What I don’t like is the escalation of pressure to elict behaviour, we now know there is a better way. Good session bridge training with Smoke – my daughters youngster. Went to catch him and he waited until I was about a foot away and came to meet me. Yesterday he just walked off as soon as I was anywhere near. Took him to the arena and let him loose – he followed me to the gate and I went outside the arena and stood by the gate. He was calm and I bridged and he looked away fairly quickly to get his treat. Next I introduced a target – he wasn’t sure about this and backed off. I stood quietly holding it and let him come to it, bridged for just sniffing and treated when he turned his nose away. He had a few moments of trying to get a treat but I walked away and let him calm down. He is still not sure of the target but he did touch it a few times so I left it there and went back in the arena, he stood next to me – no mugging and I gave him a few more treats. Then we walked back out into the field and I left him with some treats on the floor. Hope this improves over the next few days – he didn’t walk so close today – usually he has his nose on my arm. Very pleased with Smoke, must not ignore Benny though.